The post Weekend Events | Naples FL | April 26 – 28, 2019 appeared first on Sonja Pound. While Earth Day is officially April 22, there are many celebrations across the country and in the Naples area this weekend. Do you know the first Earth Day was in 1970, after US Senator Gaylord Nelson witnessed the impact of the 1969 massive oil spill in Santa Barbara, California? He thought having a day focusing on environmental issues would force environmental policies to be on the agenda with politicians and the media. You have many opportunities to celebrate our Earth whether it’s an an official event at Calusa Nature Center or just by getting outside and enjoying what our area has to offer. Please share this post with family and friends. If you go to any events, I’d love to hear about them in the comments on Facebook. The post How To Choose a Real Estate Agent appeared first on Sonja Pound. Buying or selling a home is not like buying a car. Often, when buying a car, we are assigned the next salesperson available. You take a test drive, talk about numbers and the deal is done. Not so fast in real estate. You do not have to settle for the first agent you are referred to. Whether it’s a result of walking into an agency and you meet the next agent on the list. Or, you are referred by a family member. According to floridarealtors.org, 34% of all Florida buyers found their agent through a friend, neighbor or relative. A word of caution. Not all agents are created equal. And, this relationship should be long-term. Make sure your personalities, styles and goals match. A little work up front can save you a lot of headache later. Hiring the right real estate agent can be the difference between buying your dream home or ending up incredibly frustrated and without the home you wanted. It all begins when you hire the right agent. But, how do you know if an agent is the right agent? Do you choose a real estate agent from an ad in a magazine or because they have a sign on someone’s lawn? So often I hear stories from customers that have worked with agents and had a less than stellar experience. Buying and selling a home is likely the largest financial decision you will ever make. A recently released study found that 60% of buyers only interviewed one agent.¹ You have options, and the first agent might not be the best agent, according to your needs. 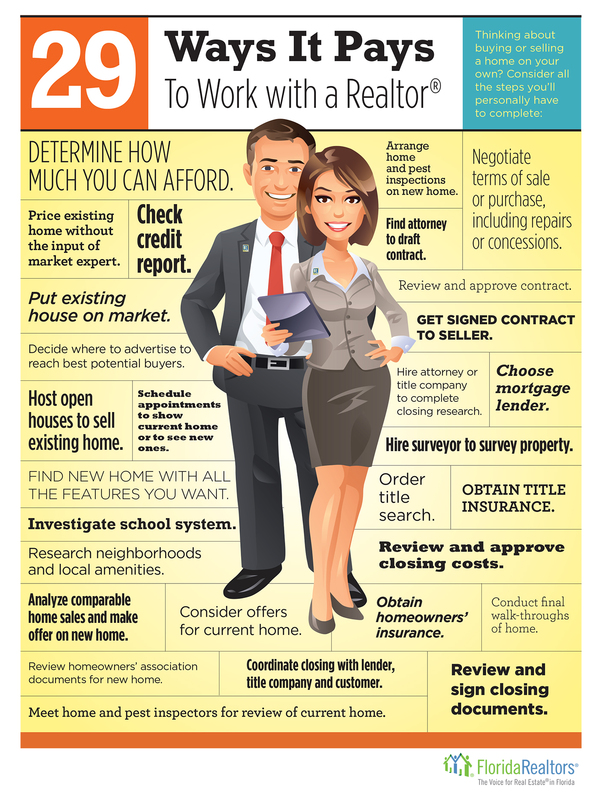 Here are some suggestions to help you hire the right agent and reasons why you should work with a qualified Realtor®. Can I see some of your marketing materials? Do you have professional photos taken for every listing? Should I expect regular communication from you about the process? What was your background before working in real estate? Tell me what’s important to you in the transaction? What real estate designations do you have? How do you go above-and-beyond for your customers? You might be wondering about the purpose of some of the questions. Let me explain a few. Why would you ask how an agent networks? Simple. Let’s say an agent has no appointments for the day, and they sit home to work on future marketing and make a few phone calls. That’s great for the agent. But, it’s not so great for you. What if, instead, that agent chose to stop in and say hi to local builder’s sales representatives, title companies, their real estate office or attend a class at their local board? By doing that, they now have an opportunity to network with other real estate professionals about your home, the opportunity to hear about any new properties coming soon and the latest builder’s incentives. If you are selling your home, the more people that know about it – the better! If you are buying a home, wouldn’t you want to know about an amazing home before it hits the market? Why is it important to ask about their background before working in real estate? Not everyone has been in real estate for 30 years. That does not make them less quailified. In some cases, you might actually receive better communication and customer service from a newer agent that isn’t working with 10 other customers. Maybe they worked in marketing for 15 years before starting their real estate career. If you are selling a home, working with someone that has a strong marketing background will likely benefit you. Did your agent work in human resources before real estate? That’s not a bad transition either. They likely have a way of working with people, understanding different personalities and know how to remain calm under pressure. How do they go above-and-beyond for customers? This is so important. Not all real estate transactions follow a straight path to closing. Some have a few bumps in the road and detours along the way. Knowing how an agent will handle those bumps is critical to a successful transaction. Will they provide expert advice on any changes you might need to make before listing? Will they hire a cleaning company before walk-through? Will they stage the home, if needed? Can you rely on honesty at all times? Are they problem solvers and don’t easily take no for an answer? Need help finding the right agent? I can connect you with top agents anywhere in the world. I have an extensive network of agents I trust and am happy to connect you with someone in your area. Let’s schedule a call so I can learn about your real estate needs. The post Weekend Events | Naples FL | April 19 – 21, 2019 appeared first on Sonja Pound. If you ever hear anyone say that Naples is a place where people go to retire – send them a link to my weekend blog posts! SWFL is alive and hopping with great events for everyone to enjoy. Of course this weekend we have many Easter-focused fun events for the kids hosted by Bounce Naples, Naples Zoo, Pine Ridge Equestrian, Pure Florida and more. Also happening this weekend are some charity events including Law Enforcement Torch Run, 5K Fun Run and bikers can join Rockstar Harley-Davidson on their annual Easter Bunny Toy Run to Golisano Children’s Hospital. It’s also a great weekend to explore Audubon’s Corkscrew Swamp Sanctuary – kid’s admission is free all weekend. The post Weekend Events | Naples FL | April 12 – 14, 2019 appeared first on Sonja Pound. The post Weekend Events | Naples FL | April 5 – 7, 2019 appeared first on Sonja Pound. The post Weekend Events | Naples FL | March 29 – 31, 2019 appeared first on Sonja Pound. Concerts, cars, coding and The Karate Kid top this weekend’s list. Your kids or grandkids can learn to code, print 3D fishing lures and play retro board games this weekend. Continue the retro theme and take them to The Karate Kid 35th Anniversary showing in Bonita Springs. Can you believe it’s been 35 years?! If you’re up for a drive across Alligator Alley, head to the Palm Beach International Boat Show; happening all weekend. And don’t forget to show your support for our men and women in blue at the Blues for the Blue Concert on Sunday at Cambier Park. The post Weekend Events | Naples FL | March 22 – 24, 2019 appeared first on Sonja Pound. The post Weekend Events | Naples FL | March 15 – 17, 2019 appeared first on Sonja Pound. There’s a well-known saying, “If you’re lucky enough to be Irish, then you’re lucky enough.” This weekend everyone is lucky enough as we celebrate St. Patrick’s Day with many Naples area events. Prepare to enjoy the excitement of being Irish even if your ancestry DNA test doesn’t show a hint of Irish blood. Grab your green garb and celebrate with the inaugural Thirsty Leprechaun Trolley Crawl, Fifth Avenue South Parade, St. Patrick’s Day Party at Momentum Brewhouse or Irish Weekend and Food Truck Cookoff at Celebration Park. Not feeling the Irish luck, there’s still plenty to do like the Collier Fair featuring a Crash and Bash Demolition Derby, 50+ rides and entertainment for everyone. Please share this post with family and friends to start your St. Patrick’s Day weekend fun. The post Weekend Events | Naples FL | March 8 – 10, 2019 appeared first on Sonja Pound. Calling all Naples kids! This is your weekend. Fishing clinic, junior jump and glow at Bounce Naples, bodacious bugs, hockey and take a look at Sunday’s events! What kids doesn’t love doughnuts and tacos? There’s also a free family fun event at Naples Botanical Garden and so much more. Keep reading to plan your weekend. Please share this post with family and friends to start your fun-filled SWFL weekend. The post Weekend Events | Naples FL | March 1 – 3, 2019 appeared first on Sonja Pound. In Naples we tend to see so many exotic cars driving down Fifth Avenue South or Third Street. This weekend you have an opportunity to see antique cars at the Beach House. And, the Swamp Buggy Races are back! I know it sounds strange, but the races are great family fun. When we first moved to Naples I took my kids there and they laughed non-stop. It’s certainly not an event you will see anywhere else. Besides that, there are many cultural celebrations this weekend; Irish Festival, Asian Food Festival, Mariachi Night and more. Keep reading to plan your weekend. Please share this post with family and friends to start your fun-filled SWFL weekend.